Begin by navigating to Setup > Storage Settings. 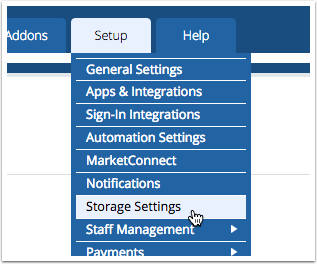 Under the Add New Configuration panel, select S3 from the dropdown menu of options and click the button labelled with a +. A modal will appear that allows you to configure the S3 storage provider in WHMCS. Enter the Access Key, Secret, Bucket Name and Region. 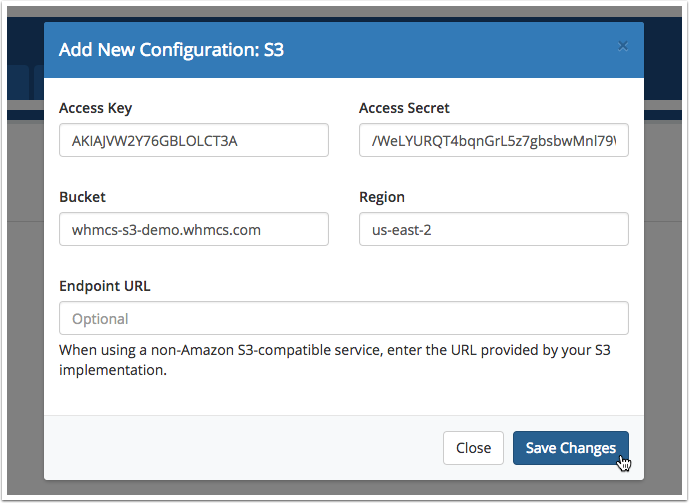 Learn how to create these in the Setting up an Amazon S3 Bucket for use with WHMCS article. Optionally, if using an S3 Compatible provider other than Amazon S3, enter an Endpoint URL for your provider. Note the endpoint url must begin with https://. Click Save Changes to validate your entries and complete the process. If WHMCS is unable to connect for any reason, an error message will be displayed. Check your entries and/or the permissions of your configured API user and try again.